Jul. 30, 2018 4:16 p.m. Warm summer days and long evenings means taking full advantage of endless Lower Mainland adventures, jaunts to the islands, and flights to destinations further afield. I’m an aviation geek so summer also means airshow season, and luckily two outstanding airshows call the Lower Mainland home. 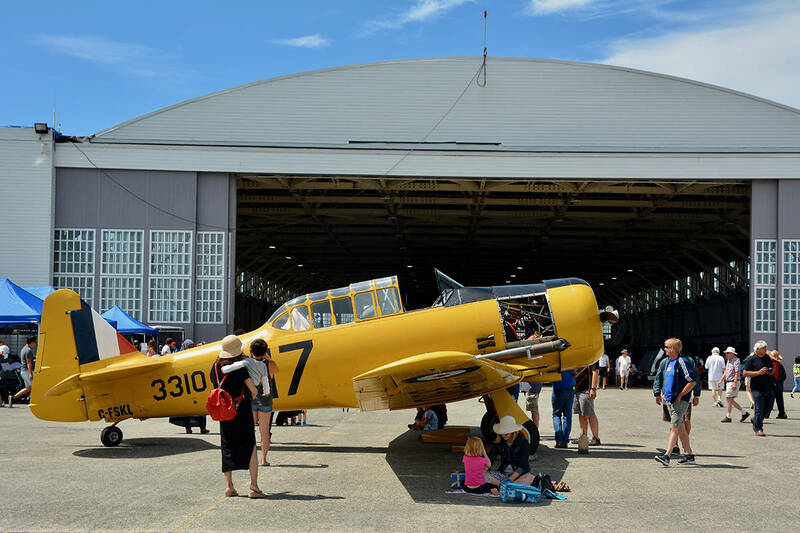 The Boundary Bay Airshow attracted enthusiasts of all ages last weekend. This free one-day event combined eye-popping aerobatic demonstrations by well-known names like Granley Family Airshows, Vicky Benzing, and Drew and Dave Watson. The Misty Blues Skydiving Team delivered the Canadian and U.S flags to the tunes of the national anthems and a sedate Gulfstream G280 fly-past allowed me to pay my own silent nostalgic tribute to a close friend, a G2 Rolls Royce skipper, who passed away this month. Happy, the Canadian Museum of Flight WW1 Sopwith Pup replica, was there and extensive static displays allowed children, parents and grandparents the opportunity to clamber aboard aircraft such as a Flair Air 737, peer into a Harvard cockpit, admire the EC120 helicopter or shop for souvenirs. Families picnicked under aircraft wings, or cooled off while inspecting classic cars in a hangar. Make sure to bookmark the Boundary Bay Airshow for next July. The Barnstormer, pictured at the 2018 Boundary Bay Airshow. In the meantime, you can check out the Abbotsford International Airshow on August 11, 12 and 13 at Abbotsford International Airport. Established in 1962, the show features perennial favourites such as the Canadian Forces Snowbirds, the NORAD Search and Rescue Demo team with their impressive CH-124 Sea King Helicopter, as well as many of the heart-stopping aerobatics you missed at Boundary Bay. A special shoutout here to NORAD, celebrating its 60th anniversary. Undoubtedly the CF-18 Hornet sporting a slick new “NORAD 60” blue paint livery will impress under the handling of Capt. Stefan Porteous and his team. Among Abbotsford’s big name guests this year will be the US Navy Blue Angels Flight Demonstration Team. The Blue Angels, the world’s second oldest aviation team, was formed in April 1946. No doubt show crowds will admire the F/A-18F Super Hornets demonstrating the right stuff. Program details and schedules are at www.abbotsfordairshow.com. Look for updates on their Facebook page. If markets make your day, the Fraser Valley is famous for them. Ask Langley Tourism for their excellent Circle Farm Tour maps, take a ride on the Fraser Valley Heritage Railway Interurban between Cloverdale and Sullivan, and mark your calendars for Cloverdale Market Days on Saturday, Aug. 18 and Sept. 22, from 10 a.m. to 3 p.m. Fresh farm produce, arts, crafts, eateries, clothing stores and music will encourage you to shop ‘til you drop into one of the local eateries along the historic 176th Street. While in the area, take a gander at the under-construction Museum of Surrey set to open Sept. 29, when the dinosaurs will be waiting for you! To keep you posted ‘like’ the MoS Facebook page and website. Both are updated regularly. For something less strenuous, but equally entertaining, take a trip with FlyOver Canada at Canada Place in Vancouver, or hop on the Vancouver Trolley and be surprised at all the facts you didn’t know about Vancouver. Don’t forget summer theatres. Imagine yourself in Greece, thanks to Mamma Mia at the Stanley Industrial Alliance Stage, 2750 Granville Street, until August 12. Guaranteed to lift your spirits. Check www.artsclub.com for times, tickets and subscriptions. Bard on the Beach Shakespeare Festival at Vancouver’s Vanier Park on a summer afternoon, or evening, is hard to beat. This year Bard is staging As You Like It — set in Vancouver and highlighted with Beatles music. Will you love it? Yeh! Yeh! Yeh! Macbeth offers a bow to the traditional, but there’s also Timon of Athens, which should prompt contemplation of “our place in this shallow world”, and Lysistrata “a glorious, bawdy romp that investigates how humour and art can take their place in the political arena,” so I’m told. Hmm… we seem to be getting a lot of that these days. For the details go to www.BardontheBeach.org. Or, as a Scottish wit once said referring to Glasgow’s Ibrox Stadium, you could go the halls of learning — and take in a football match at BC Place. Vancouver Whitecaps face off against the New York Red Bulls, August 18, and the BC Lions and Saskatchewan Roughriders are set to battle it out on August 25. Check with TicketMaster.ca. Whatever your pleasure, have a great summer, and remember —if you’re not barefoot, then you’re overdressed. Well, at least in sandals! Ursula Maxwell-Lewis is a British Columbia-based writer and photographer. Contact her at utravel@shaw.ca.